When you’re unwell, you take a day off work and return the next day without severely affecting your job. However, when you’re critically unwell, e.g., cancer, you become debilitated and require a long period of rest. This jeopardizes your ability to work. Fortunately, critical illness plans are plans that provide a lump sum of money whenever you are critically ill, to help you cope with the period when you’re not working. The problem with critical illness plans is that they terminate upon paying out and do not account for relapses of critical illnesses. As such, in the recent years insurance companies came up with multi-pay plans, plans that provided multiple payouts throughout the payee’s life. 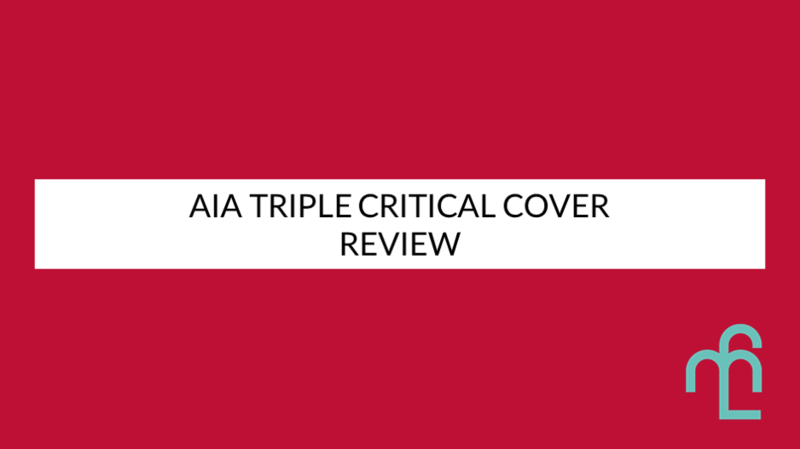 In this article, fundMyLife reviews the AIA Triple Critical Cover and describes its notable features. Note: this article is accurate as of September 2018. The AIA Triple Critical Cover is a multi-pay critical illness plan that covers illnesses in the early, intermediate, and critical stages. It comes in two forms – the Value Plan and the Life Plan. The Value Plan protects you until the age of 75. The Life Plan protects you until the age of 100, when your policy matures. One of the highlighted features of the plan is the ‘reset’ feature, where your critical illness coverage returns to 100% after 12 months. You can get up to 3 times of your coverage amount for different critical illnesses across different stages. The payout amount is additional 20% of the covered amount, up to a maximum of $25,000 per condition. Interestingly, the AIA Triple Critical Cover Life Plan gives you the option to surrender your policy after your 60th policy year or 75 years old, whichever is earlier. This amount is a guaranteed cash value of 75% of whatever your coverage amount was, less the claims paid out for critical illnesses. Alternatively, your Life Plan policy matures when you are 100 years old, giving you back the full coverage amount minus the claims. In the case of death, the AIA Triple Critical Cover pays out 100% of the coverage amount (after deducting any critical illness claims) and an additional $5,000 benefit. 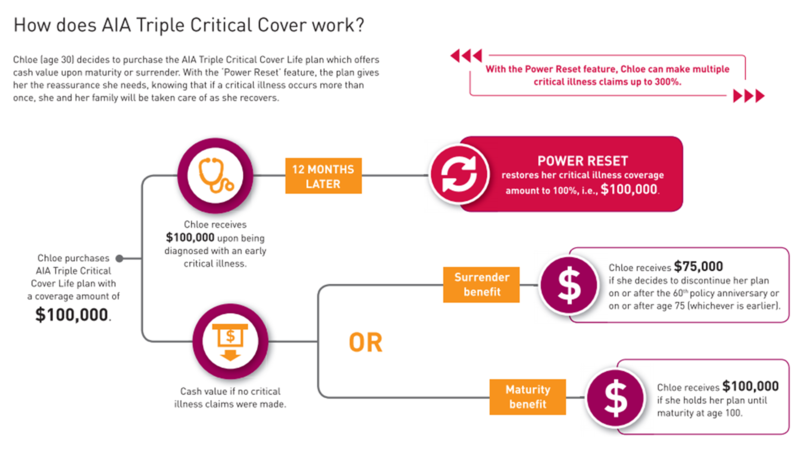 The AIA Triple Critical Cover is a hybrid of a life plan and critical illness, since you have death benefit and payouts from critical illnesses. However, don’t count on the death benefit since you’d be better off getting a proper life insurance plan. There is no premium waiver in the case of critical illnesses, so you’ll have to be careful to ensure that you’re able to maintain premiums in the case of critical illnesses. There are only 5 conditions that qualify for special benefits. These five conditions are statistically common, e.g., diabetes complications and mastectomy due to cancer. The only bummer is that it is missing the benefit for insulin-dependent diabetes, which occurs quite commonly and is part of the 18 conditions found in other plans. It is highly unlikely that you will not make any critical illness claims. As such, when the policy either matures or you surrender it, you’d probably won’t get much, if any at all, since it’s cash value minus whatever payouts that you might have had. We hope you found the review useful to answer whatever questions you might have. Not sure whether multi-pay critical illness plans are suitable for you? You should ask your financial adviser. 18 Special Conditions In Critical Illness Plans: What Are They?